← Oldies from Dinosaurs In The Round… From 3D to 2D. This piece is taken from “Dinosaurs In The Round” too. 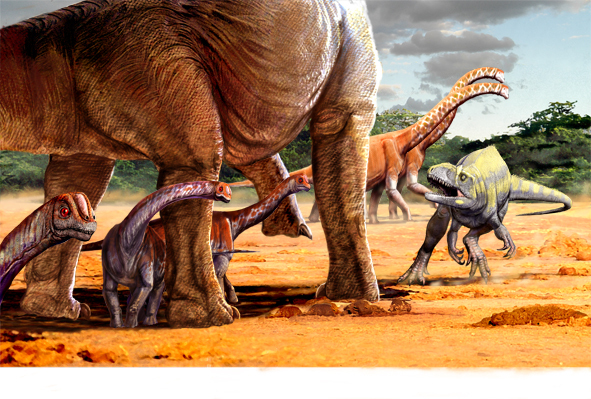 Hunting pack of allosaurs try to bring down a medium sized sauropod (Camarasaurus). This scene is inspired by a sculpture group scene I saw in an “exhibition” made in the gardens around the Rocca dei Rettori in Benevento (that we visited with our friends Marco Signore and Luciano Campanelli while I was invited to do a talk and exhibition for a Palaeontological event in Benevento). The park was a bit abandoned, but it was nevertheless beautiful and the anatomy of the dinosaurs sculptures was fairly accurate. It is also predominantly inspired by the way lions bring down buffalo or even elephants… pack hunting at the highest level! However, I doubt very much that Allosaurus could do anything with Brachiosaurus… except perhaps attack babies or scavenge a leg or two (these two are from “Dino Babies”…. see it in 3D in the new “Dinosaurs In Your Face” compilation). 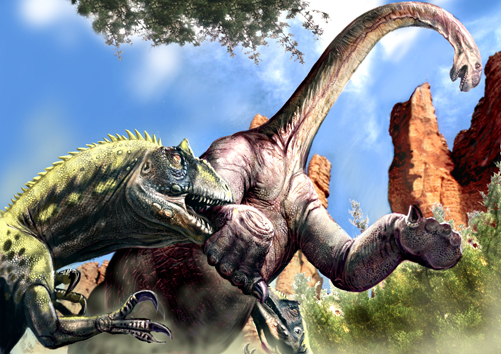 This entry was posted in Dinosaurs, Sauropods, Theropods and tagged Allosaurus, Brachiosaurus, Camarasaurus. Bookmark the permalink. Hi Luis. First of all, I’m really happy to see you with a blog. 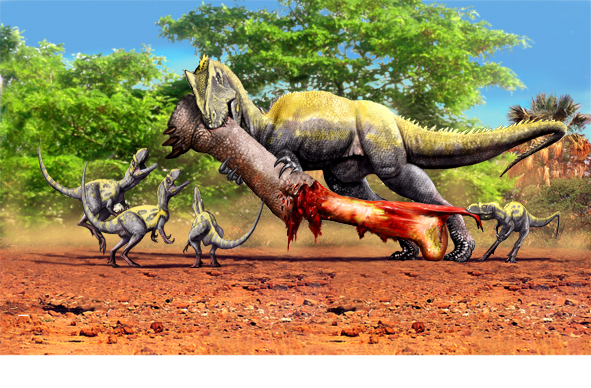 It’s fantastic to see paleoartists entering in the blogosphere and contacting with fans. Second, in the book A Field Guide to Dinosaurs written by Henry Gee, you put feathers in the Allosaurus. Obviously, there aren’t news about the discovery of feathers in this theropod or others of full size like T. Rex, but the discovery of Yutyrannus could change it. My question is if these dinosaurs, due to their big size, couldn’t have feathers to dissipate heat as they are endotherms and more in the case of theropods that lived in places with a hot weather??? Thanks, and I’m expecting for your version of Yutyrannus!!! It’s great you noticed: yes I have added tentatively protofeathers even to Eoraptor once! However, I can’t set everything in stone until we find the proper fossil record. So in primitive or basal theropods I >sometimessizeableyour< request! Thanks.